This week is a big one for us in habitat conservation and restoration. This past Saturday, we celebrated World Wetlands Day and took some time to appreciate the variety and importance of wetlands around us. In case you didn’t see it, we posted on Monday about our Friday spent with students in Houma, LA. This week is also the official start of National Green Week, a set of programs developed by the Green Education Foundation (GEF) in the United States! Across the country, schools will be offering GEF programs between now and the end of April to foster greater environmental consciousness. Programs that are offered can be found on their website, listed in our “sources” section. Programs consist of 5 days of lessons and associated activities, and they explore multiple topics within themes such as green energy, waste reduction, and sustainable water. Our hope is that schools in our state implement similar lessons. Thanks to programs like National Green Week, we have more citizens who are conscious of human impacts on ecosystems than ever before. 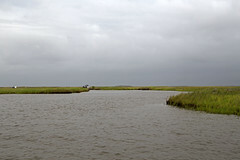 In Louisiana, programs like CWPPRA, BTNEP, and CRCL focus on telling the story of coastal land loss and all the potential consequences of letting it happen. Environmental awareness of topics like clean water, energy efficiency, and waste reduction has major benefits to the health of our coastal zone. For more information, feel free to check out our posts about measuring water quality and soil pollution. The mission of environmental educational programs is to start conversations and lay a solid foundation of knowledge that students can build on. Being introduced to pressing environmental issues at early ages nurtures better stewardship and more productive attitudes when it comes to the challenges of coastal erosion, deforestation, pollution, and other issues. In Louisiana, legislators are already beginning to realize the severity of our disappearing coast and are making changes accordingly. For this, we are extremely fortunate. We are proud to work alongside CPRA and our other partners towards our mutual goal of a resilient Louisiana coastline, and we look forward to the younger generations adopting this mission.